In my junior year of high school, my AP English teacher wanted us to do a research project on any work of literature we wanted. We were going to learn how to use MLA format with this paper, so we were to pick a substantial work in order to have enough to talk about. It had to be 10 pages, and it was the longest I’d ever had to write. I couldn’t figure out an author. I thought to maybe do Edgar Allen Poe, or maybe Shakespeare? I liked Shakespeare quite a bit. When I went to tutoring that afternoon, I asked my SAT tutor, a lovely woman with a huge salt and pepper afro and a pendant shaped like Africa around her neck, who I should write about. I’d had, at this point in my academic career, very little exposure to Black authors. Without hesitation, she told me: “You won’t be doing any old dead White men on this project, girl.” I blinked. Well, ok then. I thought. So who am I going to write about, exactly? So the next day, I went to the school library and found it. I looked at this skinny little book and thought, I have been set up for the okey-doke! I’m not going to get 10 pages out of this! But I trusted my tutor, so I checked it out and told my teacher my choice. I looked at the book in my hands. “I can handle it,” I said with a smile. I took that little 60 some-odd page book and wrote an amazing paper. Got an A. For this nail look, I downloaded a copy of the book to the trusty iPad and reread. I can say that so far, rediscovering these works has been the best part of this project of mine. If you’ve never read the choreopoem (not a poem, or a novel, or a novella,) it centers around the performance of 20 poems set to music. These poems are performed by women only identified by colors: Red, Orange, Yellow, Blue, Purple, Green, and Brown. More often than not we suffer in silence. Abortion rights, in general, are cloaked in silence. Women can’t be sexual beings, and if they are, they have to publicly show their shame for their mistake–carrying a child to term is their penance. We won’t debate this point here today. The point is, one shouldn’t have to go through tough times alone. Hurt alone. Shame shouldn’t drive people to silent suffering. With this concept in my head, I dedicate this week’s Nails of Literature to the Lady in Blue. Presenting: Blue Lady’s Blues. Right hand is on the left; left hand is on the right. The base of the manicure is Frenzy by Orly, the accent color is Keeping Suzi at Bay by OPI. 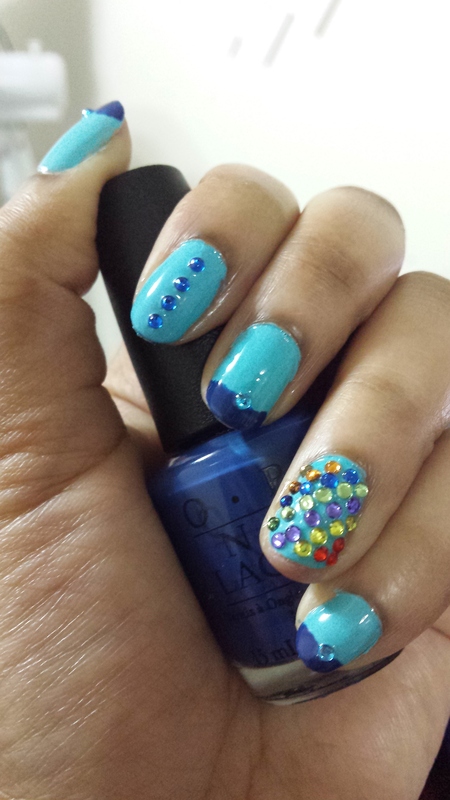 The rainbow accent nail (there’s one on each hand) represents the name of the work, and the 4 rhinestone accent nail represents the Lady in Blue. I only did one nail like this to represent the loneliness in the poem. 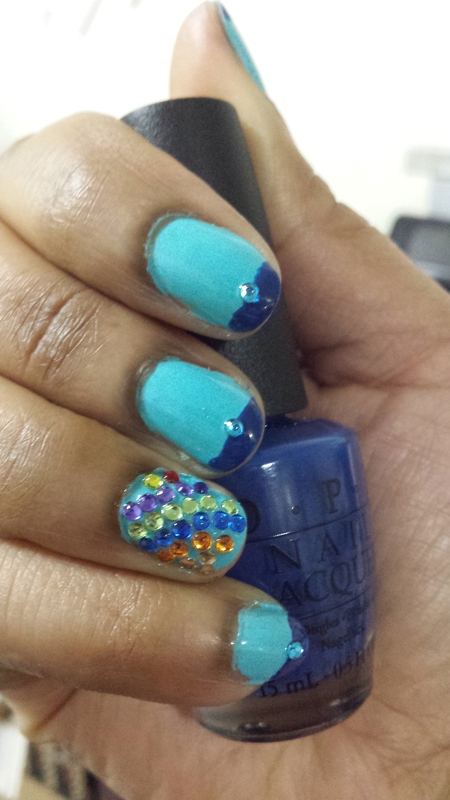 Despite the seriousness this manicure represents, it was a lot of fun to create. See you next week for the next installment! Know a work you want to see represented in manicure form? Email me! Thanks so much! I downloaded a copy from Amazon for around $9, if you have a compatible device. Rereading has been the best part of this project!